We are proud of the experience and knowledge-base that our facilitators are excited to share with you. From Naturopathic Doctor to Chiropractor to movement specialists (and of course, yoga teachers), they will offer a basis of knowledge that is above and beyond other trainings. Dr. Robyn’s passion for yoga began in 1999 when she first stepped onto a yoga mat. She’s been hooked ever since! After years of teaching throughout the Lower Mainland, she founded Yoga Spirit, a community-based yoga studio that she ran until 2014. Embracing her nerdiness for anatomy and integrated wellness, she completed 4-years of schooling and graduated as a Naturopathic Doctor. She combines her knowledge, love of yoga and passion for teaching together into playful and educational sessions. She exudes a natural lightness in her teaching and hopes that she can help others open up and share their inner brightness too. Robyn is the owner and a ND at Local Health Integrative Clinic on Commercial Drive, as well as an anatomy and orthopedics teacher at the Boucher Institute of Naturopathic Medicine. Dr. Vizniak is the director of Professional Health Systems; chair of Physical Medicine at BINM and is an honors graduate of the University of Western States. Aside from his training in physical medicine, exercise science, rehabilitation and diagnostic imaging. He is a globally recognized author & educator whose work & passion are derived from his desire for the promotion of clinical efficiency & excellence. Dr. Vizniak enjoys and understands the key biomechanical and spiritual role that Yoga plays in maintaining optimal health and life balance. 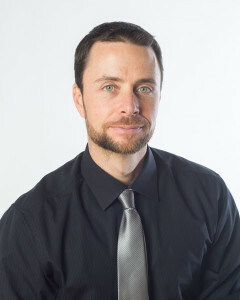 When he is not writing, practicing & researching, Dr. Vizniak teaches clinically oriented human anatomy, cadaver dissection, orthopedic & general physical assessment, numerous advanced myofascial therapies (PNF, PIR/CR, IASTM, pin & stretch, active myofascial release) & osseous mobilization / manipulation and master classes on clinical integration of best medical practices. Andrew is a seeker of adventure, and loves exploring new ideas and concepts. This has ignited and fueled his studies of yoga, movement and the connection of the mind and body. He has an endless drive for learning and researching in the fields of personal development through Intergral Coaching Canada, physical movement through many domains and philosophy. Andrews teaches the importance of honoring where students are at, and helping to empower them through their fears and resistances. With an emphasis on alignment and breath Andrew brings a fun, practical and real approach to yoga, diving into the dark and basking in the light. Andrew lives in Lund, BC and runs a sweet space called Elements Movement in Powell River. Sarah provides a warm, friendly and supportive space for students to explore what it is like to live, move and be in their body. She invites students to approach their yoga mat with sense of curiosity and compassion towards themselves and to take their practice one breath at a time; letting go of judgements and expectations. Sarah’s meditative and introspective yin and restorative classes emphasize cultivating patience, acceptance and mindfulness. Her hatha and vinyasa classes invite students to thoughtfully combine breath with movement and intention as a means towards greater personal self-awareness. In all her classes, Sarah intends to give students the space they need to breathe, explore, observe, and listen to their own body-mind experience. © Professional Health Systems Inc. 2014. All Rights Reserved.